I tell you that, I — professional sluggard! Who slobbered in so many prisons! Fourteen! And in so many hospitals! Ten! And innumerable inns! With those storms of extermination of all by all? With brutality, bottomless and measureless? who never soak their hands in blood without aseptic gloves? How else could we cope with death? and surely for that reason is ineffective. although so difficult, so inhumanly difficult, so painful! How then could we cope with all that? I admired it in person at the Hamburger Kunsthalle last weekend. It seemed darker in person — I think the digital version may have been brightened a little. Nevertheless, a nice chunk of late Romanticism, dusted with kitsch. The modeling of the buck's solid, sagging flesh and horns is nicely plastic. I chuckled over the translation of the German word tränken as "saturate". But then I became thoughtful, and stroked my chin. There's no easy translation for tränken. Tränken describes only how animals drink. Humans trinken, animals tränken. Same thing for eating: humans essen, while animals fressen. Add to that the fact that English has no simple transitive word for "give water to". You can "water" plants, but that always implies pouring water over or into something. You wouldn't water your dogs or your children, you would only give them something to drink. The translators seemed to realize this, but then fatally chose "saturate" as the proper translation from the other entries on the dict.leo.org list. But how can we blame them? The meaning comes across, sort of, and the only other alternatives would have doubled the length of the title, which doesn't seem right. The other titles were translated quite well. The new Euros are much less impressed. I can only think of two explanations: either people in these countries were more favorable to Bush than those in the West, or they simply didn't perceive the change in leadership as very significant. In any event, it's a bit hard to imagine that the French are significantly more approving of U.S. leadership than the Poles. Good news for Barack Obama today! Um, sort of. 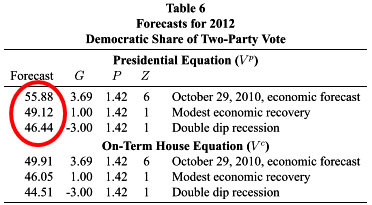 Ray Fair has released a forecast of the 2012 presidential race based on his well-known political/econometric model, and he says Obama will win in a landslide. It thus comes down to what the economy will be in the next two years, which is, of course, what the equations are all about. If the recovery is robust, which my economic model predicts will begin to happen in the middle of 2011, Obama wins easily. If the recovery is only modest, the election will be close, with an edge for the Republicans. If there is a double dip recession, Obama loses by a fairly large amount. His topline forecast is that Obama wins 55.88% of the popular vote, which sounds reasonable for an incumbent president presiding over a robust economy. But if recovery is fairly flat, which is hardly out of the question, suddenly Republicans are favored to win the White House. Visit them on myspace here. Dragtontape lets you splice together up to 3 hours' worth of YouTube clips. The interface is brilliant, the results more than satisfactory. Bonus: On the YouTube page for Ligeti's 'Atmospheres', a wag named EdWood2006 asks if anyone has "easy guitar tabs" for it. So, they're now growing again. It's kind of spooky. Yet, soon I'm gonna have me more purty flowers! My question for the botanically-inclined is: why is this happening right now, on the cusp of winter? How can I make sure it continues happening? Should I take the pots in from the balcony, or do they need lots of light? From Aus­tria, to France, to England, to the United States, and now far-flung Brazil, he must have felt like an untethered punt drifting up against a river­bank. "I ceased to feel as if I quite belonged to myself. A part of the natural identity with my original and essential ego was destroyed for­ever." He might well have been glad to build a new existence in Brazil, since, as he wrote, "the world of my own language [had] disap­peared for me and my spiritual home, Europe, [had] destroyed itself." But not at the age of 60. Suddenly, thrust into the wings of his­tory, this urbane man about Europe had be­come yesterday's man. But the damage was done not in 1933 when Hitler became chancellor of Germany, or on Kristallnacht in 1938, or on Sept. 1, 1939, when Germany unleashed World War II. The real damage was done in 1914 when the "world of security," as Zweig referred to it, came to a sudden end. Unfit for military serv­ice, he had been assigned to the archives of the Ministry of War, but by 1917, while on leave in Switzerland, was finally dismissed from service. It was in neutral Switzerland, under the aegis of the 1915 Nobel laureate Romain Rolland, that he became a confirmed pacifist. It was also in Switzerland that he became aware of a certain cast of people who, in his words, lived "amphibiously"—that is, between countries, between languages, between loyalties and identities: in short, in exile. Do you want to know more about Belgium? (subtitled NL/FR) from Jerome de Gerlache on Vimeo. Bonus Belgian rap: Uman and Flip Kowlier lovingly take the piss out of their homeland.